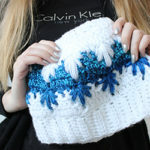 Today I’m sharing a special crochet hat design for people on a journey. 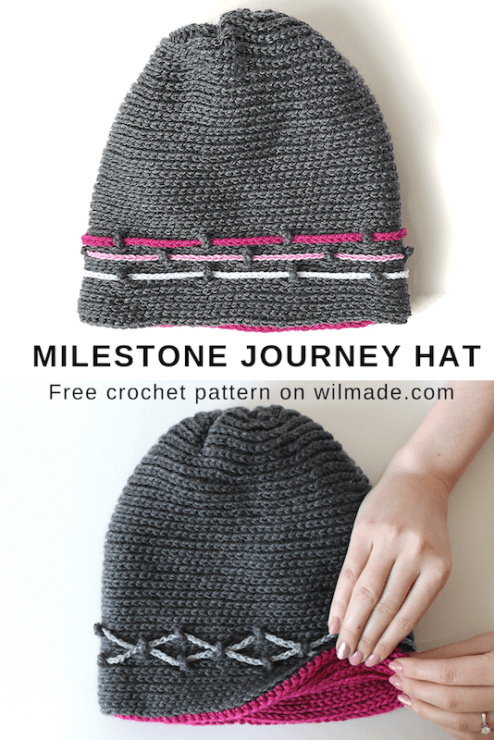 It’s called the Milestone Journey Hat and is specially designed for those who are (or were) on a journey. 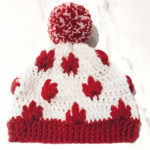 The hat can be personalized with beads which tell a story: the beads represent a treatment, special event, victory or milestone and form a visible representation of the journey. A while ago I got contacted by a very kind woman who has a condition that causes hair loss. 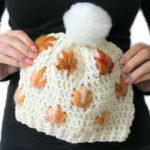 She asked if mom and I could design a customizable crochet hat that is warm enough for the cold winters. She said she was looking for a simple pattern that can be made in different colors and with different materials, because this way she can make matching hats with all her outfits. She preferred a hat with a bit more volume, as there is no hair underneath it. We immediately tried out some ideas. We decided to work with a luxurious yarn called Katia Cotton Cashmere which feels very soft and pleasant on the skin. To make sure the hat is warm enough, we decided to make a double layered hat. This automatically creates some extra volume as well. 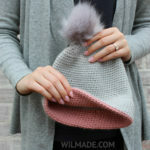 Besides the colors and materials of the yarn, we wanted to give an extra special touch to the hat. 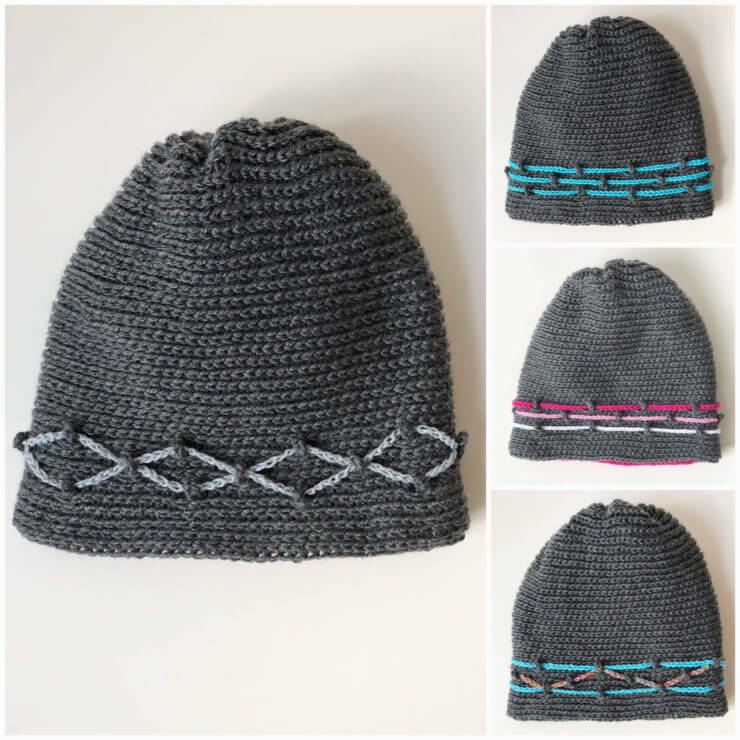 We came up with a simple idea that lets you easily customize the hat without too much work: three simple chain cords which can be attached in different ways, creating different shapes. On these chain cords you can attach beads which represent certain milestones and moments in life. 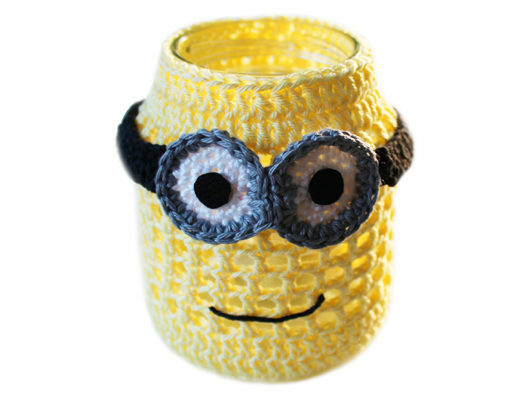 For this project I used high quality yarn called Katia Cotton Cashmere. It feels very soft (because of the silk content) and is very flexible. The color options are amazing: you can definitely find the colors you need to match with your favorite outfit. Katia is a European brand that has a special yarn line called Concept by Katia. All the Katia Concept yarns, including the yarn I used, are natural yarns which are carefully selected for the choosiest of crafters. It’s hard to get Katia yarns in the USA. I found two American sellers on Etsy who sell this yarn, you can find the shop here. You can find other similar yarn here (worldwide shipping). 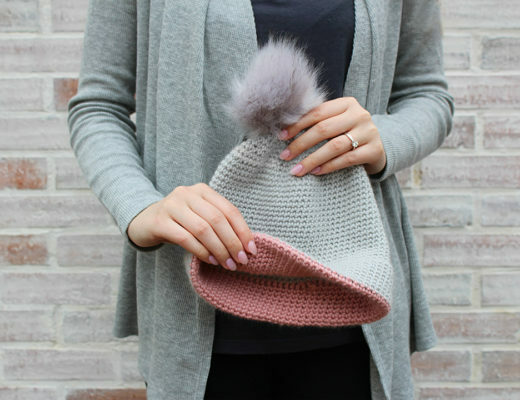 You can easily make the hat wider by making more single crochet stitches than stated in the pattern. Chain 70, slip stitch in the first ch to close the round. 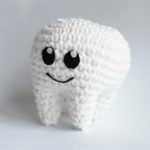 Reminder: all hdc stitches are worked in the back loops only. And back to hdc all the way! 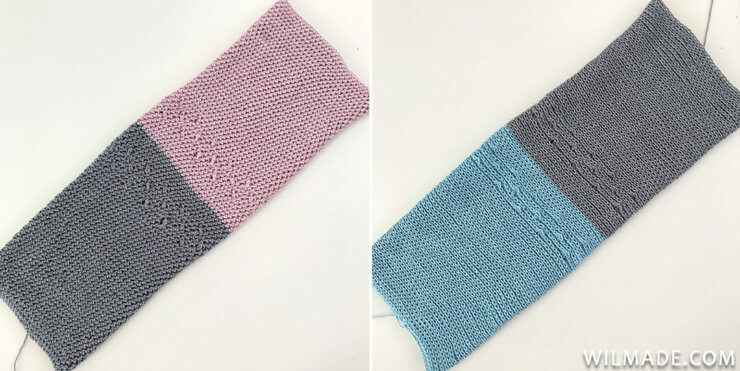 As the stitch looks beautiful on both sides, first choose which side you want to use. Make sure the ‘good’ side is facing you. Close both ends using your long tail and needle. Sew through all remaining loops. Pull the end, cinching the end shut. Tie a firm knot and weave in the end. Now fold the grey part into the blue part. 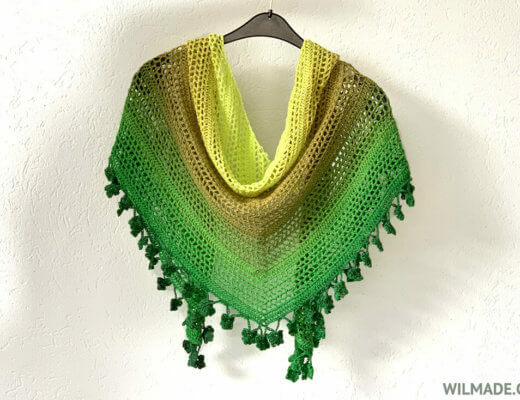 Use your scrap yarn and make three long chains (approx. 95+ chains) and use these to customize your hat. Here are some ideas. 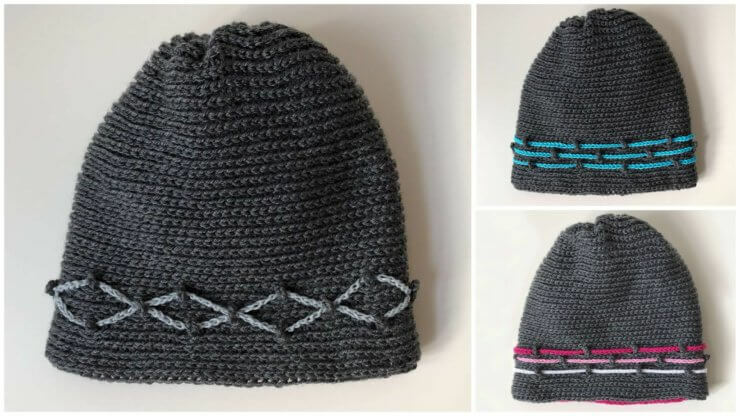 I would love to see the hats you made and the different yarn/color choices. Don’t forget to share some pictures on Facebook and Instagram, you can tag me on Instagram with my username @wilmawestenberg. 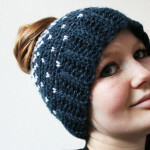 Add this pattern to your Ravelry queue here. 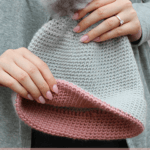 If you have any questions about this crochet hat pattern or any of my other patterns, feel free to join my Facebook Group. I created this group for you to share pictures/ progress, ask questions and to help each other out. How do you hdc and tr together? What a lovely thought and pattern, Wilma. Thanks for sharing!